The Chemung River, a major tributary of the Susquehanna River, and its three tributaries (the Tioga, Canisteo, and Conhocton Rivers) run through the scenic woodland and hills of the southern tier of New York and the northern tier of Pennsylvania. The Chemung Basin River Trail traverses about 80 miles of this beautiful Chemung Valley. A series of fourteen public launch sites provide easy access to the rivers. Online maps, launch site information and scheduled events will help you plan your trip. Paddle part of the same route that early 19th century settlers used for transporting goods down stream all the way to Havre de Grace, Maryland! 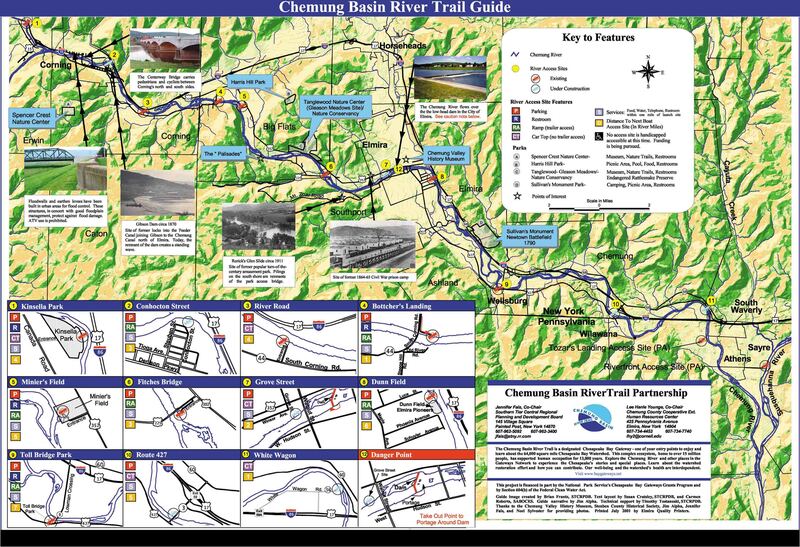 The Chemung Basin River Trail is best used by canoe or kayak. While on the river, you can fish, look for wildlife, or just enjoy the experience of floating downstream. A series of fourteen public launch sites provide easy access to the rivers. Online maps, launch site information and scheduled events will help you plan your trip. Trash disposal is not available at most launch sites or along the river; plan to use services in local communities. Use the Carry In / Carry Out bags at the access sites where available. There is currently no camping along the river. No access sites are handicapped accessible at this time.